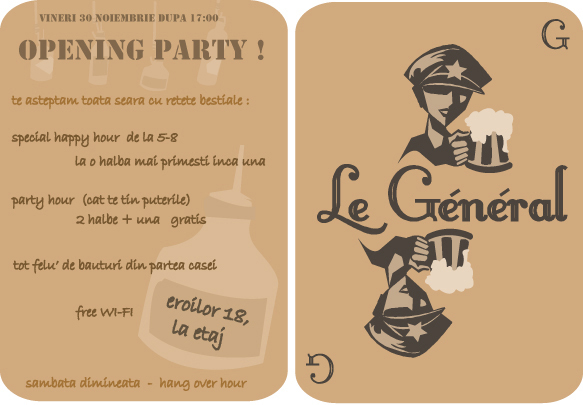 New drinking place in town, with lots of enthusiastic people just waiting for it to open, “Le General“, On Eroilor Blvd., No. 18 in Cluj-Napoca. “Fireworks” expected on the opening day, Friday the 30th of November and many promises with lots of surprises. Groparu wrote about this, and even had a party there… I’m sure he can vouch for the place also. PS: And YES, they will have a darts board!!!! Later Edit: People asked for the number of the pub, so here it is: 0745.307.161 – You can make reservations at this number. This entry was posted in english, links, news, publicitate gratuita, rant and tagged bar, beer, Club, cluj-napoca, darts, eroilor, free wi-fi, general, le general, marius, more beer, wi-fi, wifi by .marius. Bookmark the permalink. Zi-mi te rog un nr de telefon de acolo ca vreau sa fac o rezervare si nu gasesc nimic…merci! Extrem smoke! Beware! Take you gas mask, and fire extingushers too.